San Francisco-based book artist Ethan Rafal is bringing his new book, Shock and Awe, to Phoenix for an interactive launch event! We know winter hibernation and the holidays are in full swing, but if you're still in town we hope you'll come join us at Lawn Gnome Publishing for some book arts, cast-iron walnut pie, and whiskey! A twelve-year, autobiographical project examining the relationship between protracted war and homeland decay, Shock and Awe is a meticulously crafted image, text, and found object journal that blurs the line between author and subject, and personal and authoritative histories. Completed over countless years traveling the United States, the project pulls from the traditions of documentary photography and writing set on the American road. Purchase handmade blank books, decorative cards, and ephemera created by ABBA club members. Sales support student scholarships, conference attendance, members’ exhibitions, and community outreach. Interested in lending a hand at the sales table? We're looking for ABBA members and friends (or those interested in membership/volunteering) who are eager to get involved. Even if you can't work a whole shift, any help you can offer is appreciated! Belgrade University and the Students' City Cultural Center in Serbia (http://www.dksg.rs) sent books to us for display in OVERBOOKED (ABBA's annual members show), and, as part of our exchange, we'll be sending them artists' books this fall to be a permanent part of their collection! Would you like one of your books to be a part of the Students' City Cultural Center in Serbia's collection? Send them our way and we'll handle shipping and all arrangements! Remember, these books will not be returned, as this is a permanent exchange, and you must be an ABBA Member to take part (dues can be paid in person or online). Please drop off work in the Type Shop, School of Art Room 45, between 9 AM and 12 PM (noon). OR email ABBA President, Angie Dell, to arrange a different drop-off time. We'll be taking down the Book Arts Show in the Harry Wood Gallery from 2-3 PM, right after the ABBA Club Meeting at 1pm. If you can lend a hand for a few minutes, or simply want to drop in to pick up your book(s), come on by! We'll be discussing upcoming events for the rest of the semester and year, and officer roles for those who might be interested. Stop by if you'd like to be involved with the club and ABBA book-making activities this year--all are welcome; no experience required! And, as always, we'll have snacks! Congrats to Emily Longbrake, Djurdja Sivački, Mac Bydalek, Alexis Rainery, Angie Dell, Kate Horvat, Milena Putnik, Marija Sibinović, Michelle Segal, and Emily Ritter! Their works, featured in OVERBOOKED, were juried for special awards by Heather Green! Closed: Saturday, Sunday and holidays. Excited to begin ABBA's artists' books exchange with Belgrade University and the Students' City Cultural Center in Serbia! http://www.dksg.rs. We'll be sending our stuff over in the fall to be a permanent part of their collection, and they'll be sending stuff to our Member's show too! Please drop off work in the Type Shop, School of Art Room 45, between 10 am and 4 pm. If you need to arrange a drop off in advance, please let us know. Wanna be a part of this show? All ya gotta do is pay your dues! Entering our 15th year, the annual exhibition features handmade and commercially printed books made by local students, artists, and community members. This year's exhibition will feature guest artists from the Students' City Cultural Center, in Belgrade, Serbia. Juried by Heather Green, ASU Book Arts faculty, this exhibition showcases the creativity of bookforms and various bookbindings. As part of the exhibition, a fundraising sale will help support club members in attending local and national conferences. This Friday, Oct. 2, we are excited to be installing our 15th annual members' show Overbooked. We will begin prepping around 3 p.m. and hope to get done installing by 8 p.m. Please email ABBA Prez Kate Horvat (kmhorvat@asu.edu) if you are interested in volunteering for either one of these shifts. Also get the opportunity to send work to Belgrad, Serbia for a student exchange. (no attendant will be available), or email Kate at kmhorvat@asu.edu to make other arrangements. If you are not able to drop off work at that time, please mail it to Kate Horvat. WORKS MUST ARRIVE BY WEDNESDAY, SEPTEMBER 23. WANT TO SEND WORK TO SERBIA? Please clearly label which work you wish to send to Serbia. THANK YOU. ABBA ❤s BOOKS. "PLEASE, DO SHOW N' TELL"
Bring your handmade artists books. We want to see them! No books? No problem. Come check em out! By the way... LUNCH IS PROVIDED. Come join us for the next ABBA meeting--an end of the schoolyear send-off! We're going to make it a big one, so be sure to mark your calendars! I can attest that ABBAers are on top of their brunch game. So come one, come all, bring your friends, bring your books, and celebrate the end of the school year with other book, printmaking, and brunch fanatics! At the brunch, we'll talk about our 15th Annual ABBA show in the School of Art's Harry Wood Gallery with invited students from Belgrade, Serbia. This fall we'll also send selected ABBA bookworks to be exhibited and housed in the permanent collection at the Student City Center in Belgrade! And for current members and new joining members (meaning you have paid your dues this year or for the coming year) - ABBA printer aprons! If you want to be an official ABBA Member, just bring $20 yearly dues to the brunch or pay online here. Jen Bervin, The Composite Marks of Fascicle 28, detail. ABBAers: we are coordinating a field trip to attend this exciting talk at the Phoenix Art Museum! Let us know (email ABBA officer Angie Dell: amdell@asu.edu) if you'd like to join us, and we can coordinate rides and/or keep a look out for you at the event. This event is sponsored by the University of Arizona Poetry Center, the Phoenix Art Museum, and UA College of Medicine-Phoenix. Event Info: Join us for an artist's talk from Jen Bervin, co-editor of The Gorgeous Nothings: Emily Dickinson's Envelope Poems, which was recognized as a 2013 best book of the year by The New Yorker and Times Literary Supplement. Based in Brooklyn, Bervin works in hybrid forms that blend language, writing, and the visual arts. Her works involve strong conceptual elements with a minimalist's eye for the poetic and essential. 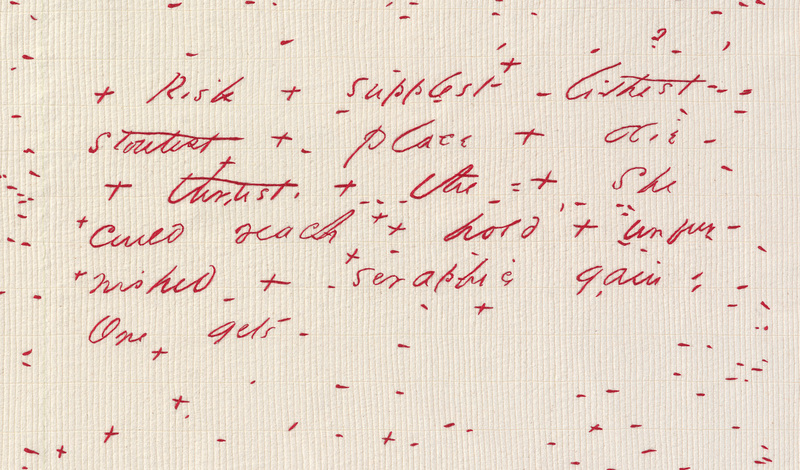 Much of Bervin's work rotates around the poles of text and textile, elaborating that ancient connection through poems, archival research, artist books, and art. Please join us on Wednesday, April 8 @ 6 p.m. at the PHX Art Museum to see Leonardo da Vinci's Codex Leicester on view until April 12! This is an informal field trip to see an amazing exhibition with fellow book-lovers. General admission is free during this time, but this special exhibition is $8. officer roles, and educational opportunities for anyone interested in the fine art of bookmaking. Featuring an origami book form workshop by Sean Gallagher! Please feel free to pass this opportunity along to any interested persons. Everyone is welcome, no bookmaking experience required! ABBA will have a booth at Art Fest and will be live printing postcards! Stop by to make yours, and stay to check out all the art club booths! 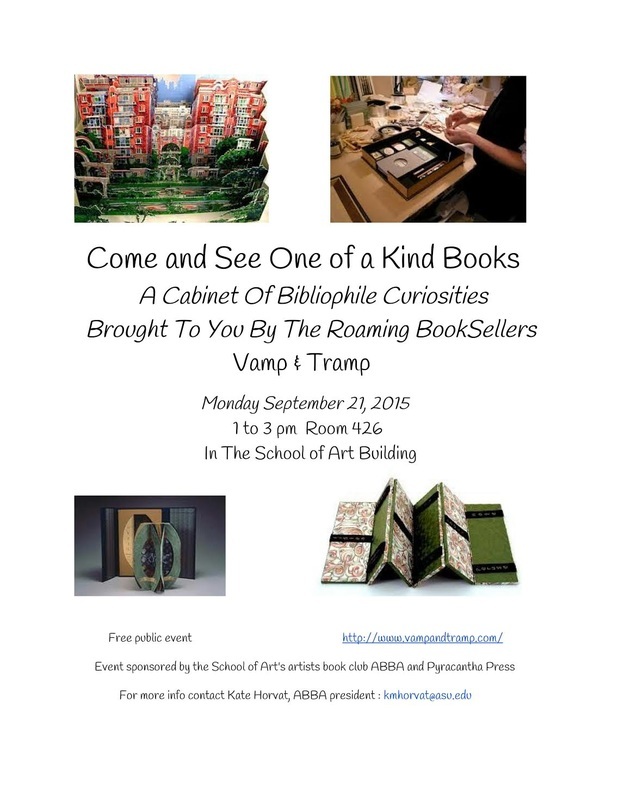 Vamp and Tramp Book Dealers will be visiting the ASU School of Art! 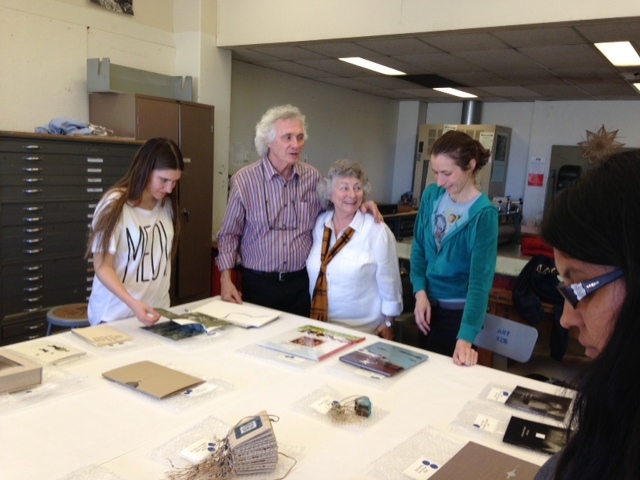 Bill and Vicky Stewart will share a sampling of fine press/artists books. Please drop by for a minute to see what artists are making and thinking in bookform! We are looking for ABBA members and friends (or those interested in membership/volunteering) who are eager to participate and want to get involved. Even if you can't work a whole shift, your help will be appreciated. Third general meeting of Fall2014 to discuss this semester’s events, happenings, our annual holiday sale, and educational opportunities for anyone interested in the fine art of bookmaking. Congrats to Adam Montoya, Diego Lozano, Eli McGlothern, Christine Holm, Monica Garcia, Krystal Harper, Motoko Furuhasi, and Zach Bootz! Their works, featured in STRAT-O-GRAPHIC, were juried for special awards by Donna Isaac, Director of Scottsdale Public Art! Gallery hours: 8 a.m. - 5 p.m. Entering our fourteenth year, the annual exhibition features handmade and commercially printed books made by local students, artists, and community members. Juried by Donna Isaac, Director of Scottsdale Public Art, this exhibition showcases the creativity of book forms and various book bindings. Works from guest artists from the University of Illinois will also be represented in this show. As part of the exhibition, a fundraising auction will help support club members in attending local and national conferences. juried by Donna Isaac, director of Scottsdale Public Art, with guest student artists from the University of Illinois! Please drop off work in the Type Shop, School of Art Room 45, between 10 am and 4 pm on Oct. 17. If you need to arrange a drop off in advance, please let us know. You must be a fully paid member to participate. You can pay at online here, or when you drop off your work you can pay with either cash or check. We are also seeking donations for the silent auction. If you are interested in donating, please contact Brandy Burdick at blburdic@asu.edu. We are very excited to see all of your wonderful work! Please mark your calendars and feel free to pass on this opportunity to any interested bookmakers. Second general meeting of Fall2014 to discuss this semester’s events, (including STRAT-O-GRAPHIC, the ABBA Annual Members' Show!) 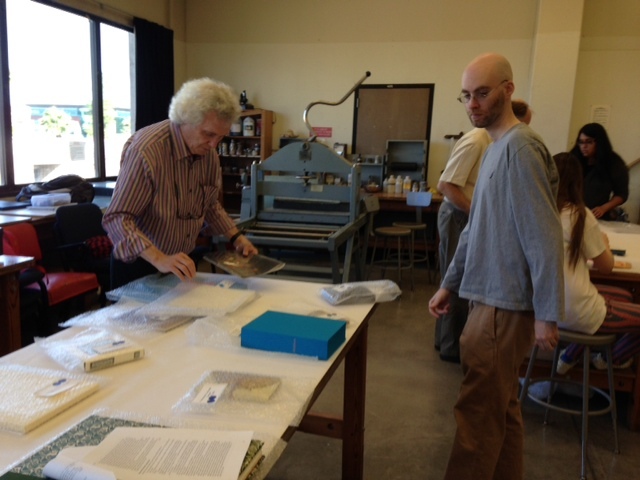 happenings, and educational opportunities for anyone interested in the fine art of bookmaking. ABBA will pick up the first few rounds of appetizers to share, and we'll discuss what's coming up this semester, including planning for our fall Members Show. Anyone interested in the club, or bookmaking, or printmaking, etc is welcome... bring your friends--no bookmaking experience required! Join us for chips and salsa, appetizers, patio seating, and sunshine. We will have a brief discussion on upcoming events, happenings, and educational opportunities through ABBA. BYOBooks to share for a show-and-tell with the group if you like! Please feel free to pass this opportunity along to any interested persons. We look forward to seeing you all there! Everyone mark your calendars for the second general meeting of 2014 to discuss this semester’s events, happenings, and educational opportunities for anyone interested in the fine art of bookmaking. ABBA will be printing complimentary letterpress keepsakes to celebrate ASU's Desert Nights, Rising Stars Writers Conference. Stop by the basement Type Shop in the nearby ART building anytime between the hours of 10:00am and 2:00pm to run your own print through the press, with assistance from the club's student and community members. To volunteer, or for more information, please contact ABBA Prez Kate! 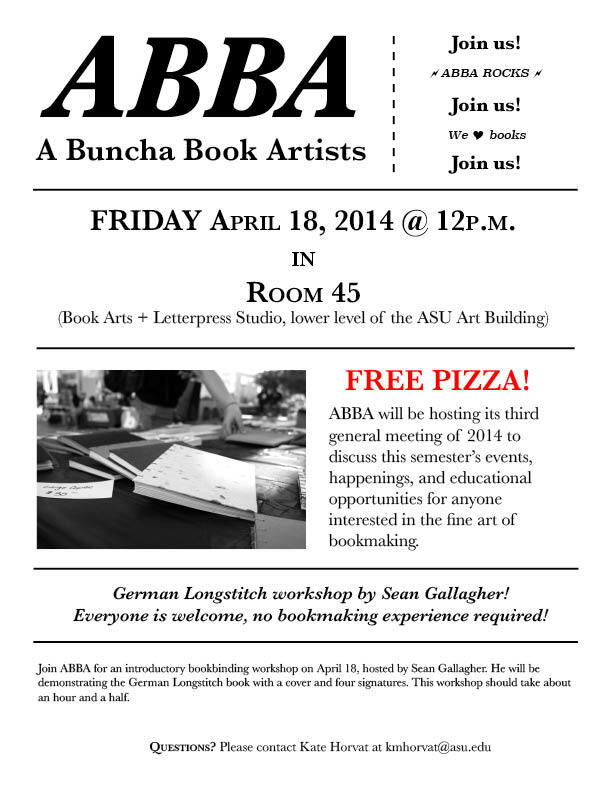 Stop by our ABBA book arts table! Join us for the annual ASU School of Art Student ArtFest in Neeb Plaza from 3–6 p.m. Student art clubs representing metal, wood, fibers, painting, printmaking, drawing, ceramics, photography and sculpture will give demonstrations and exhibit new work. You’ll have the chance to buy art and make some of your own, get free samples from local art vendors, art swag and original work giveaways made by ASU art students. Join us at 1pm in Room 426 for our first meeting of the semester, followed by a printing day at around 2pm in the Type Shop. We'll be discussing upcoming plans for the semester, and getting started on our printing projects for the SOA ArtFest and Desert Nights, Rising Stars Writers Conference. No previous letterpress experience required--ABBA will show you the ropes! What: This is an open call for submissions to create a design for ABBA's ArtFest keepsakes, which will be distributed out to hundreds of people on February 18th. Theme: The Five C's of Arizona: Copper, Cattle, Cotton, Citrus and Climate. Pick one to highlight in your design or incorporate all of 5! How: Please scan in your hand-done drawing at 300 dpi, or construct an image into a PDF file from Illustrator at a resolution of 300 dpi. 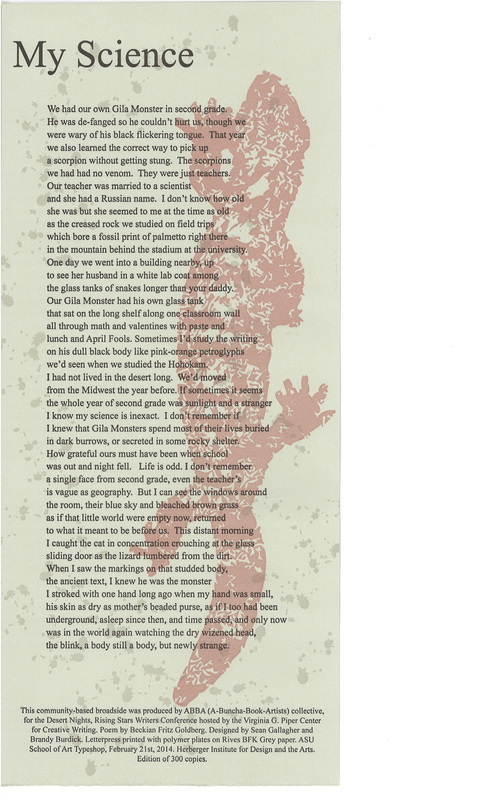 Vertical Format: (HxW) 4.5 x 3"
Photoshop j-peg file is okay too as long as it does not have text (rasterized/jagged). If there is text, it should be done in Illustrator (vector/smooth). Come join us for our final meeting of the Fall semester - We'll discuss ideas and events for the coming semesters, funding for the club, and new roles for 2014. Artists' Books Holiday Club Sale - Part II! Chris Adamson will share highlights of his private fine press book collection. Bill and Vicki Stewart of Vamp & Tramp Booksellers will show current fine press artists books. All students, Faculty, alumni, and community members encouraged to submit work. Handmade and commercially printed books accepted. Please deliver books to the School of Art Type Shop by Friday, September 20th, 2013. We will be discussing the annual ABBA exhibition coming up next month, a great upcoming workshop with a guest artist, funding for the club, and introducing some new members. Come, join, and participate! All are welcome!